Place butter-flavored crackers in a plastic resalable bag and crush with a wooden spoon or rolling pin until finely crushed. Pour crumbs into a bowl and stir in melted butter. Evenly press the crumb mixture into 8 individual serving glasses or mini ramekins. Evenly sprinkle the 10 finely chopped mini peanut butter cups over crumbled mixture on each glass. To make filling, beat cream cheese with an electric mixer until light and fluffy, about 3 minutes. Gradually add the powdered sugar and continue beating until smooth. Beat in vanilla. Fold in whipped topping. Evenly spoon the filling over each glass, smooth each top and place in fridge to firm, for about 2 hours. When ready to serve, melt chocolate chips and peanut butter in microwave, separately until smooth. Drizzle with melted chocolate and melted peanut and garnish with 8 additional mini peanut butter cups. Create this recipe using a mix and match of your favorite candy and pie filling. 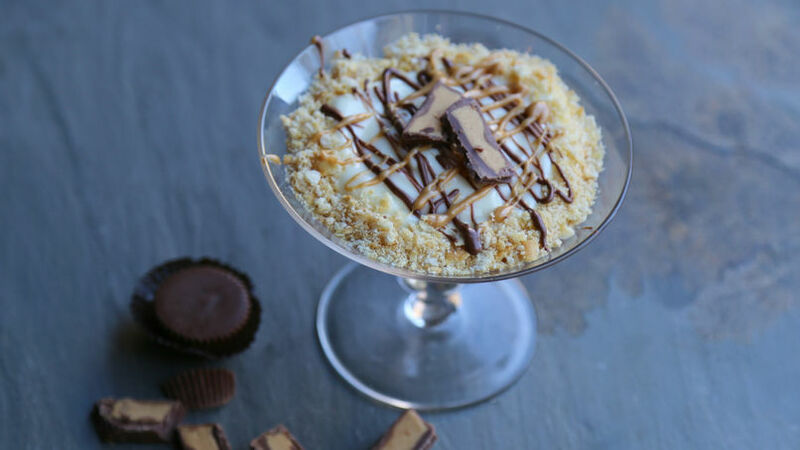 Today we’re adding a fun twist to the classic cheesecake by incorporating the flavors of peanut butter cups. These individual serving cheesecakes are the perfect no-bake dessert to serve on Valentine’s Day or wonderful for a children’s party!